Xylitol has 40% less calories than sugar, as it is not fully absorbed in the intestine. It is a suitable sweetener for use in diabetic and carbohydrate management diets. (Can have a laxative effect). Xylitol is a sweetener found in many fruits and vegetables and is even produced by the human body during normal carbohydrate metabolism . 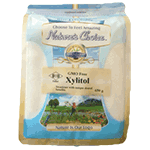 Xylitol is typically manufactured from birch trees or other natural xylan-rich sources.